While I provided an update on my earlier post, I thought I’d write again to let you know how things went. When entered my viva today (what the British call their thesis defenses) there were five possible outcomes: 1. Abject failure. I walk in and they tell me, “Nope, sorry.” 2. Referral, this is not technically a pass but nor is it abject failure. This means there’s a significant amount of work to be done, with the possibility of another viva at the end. This option provides 12 months to fix the thesis. 3. Minor Corrections, 3 months. The thesis is good, but needs a bit of work, nothing 3 months can’t sort out. This counts 4. Minor corrections, 1 month. Same as minor corrections, 3 months only there are fewer issues. 5. No corrections. Pretty self-explanatory. I walked in believing number 2 the most likely, given the circumstances under which I finished my thesis. Also one of my supervisors wanted to make sure I was prepared for this possibility. So, I assumed this would be my outcome. Before I tell you the outcome, let me tell you a bit about the process. A viva, short for viva voce which essentially means to live by one’s voice, is an oral defense or examination of one’s thesis. You are set down with two examiners, one from your university and one from another, and they ask you questions about your thesis. Their job is to ensure that you are master of the information you have compiled and created. They have to push you. They have to get you to concede when you were wrong and to defend yourself when you’re right. For me, this went on for two hours with each examiner asking a series of questions. There’s also a person called a chair or moderator. Their job is ensure everything is on the up-and-up, that you get no undue punishment or praise. After enough questions have been asked and answered, you’re sent out of the room for a bit. After which they call you back and are given one of the above five responses. I was given minor corrections, 3 months. 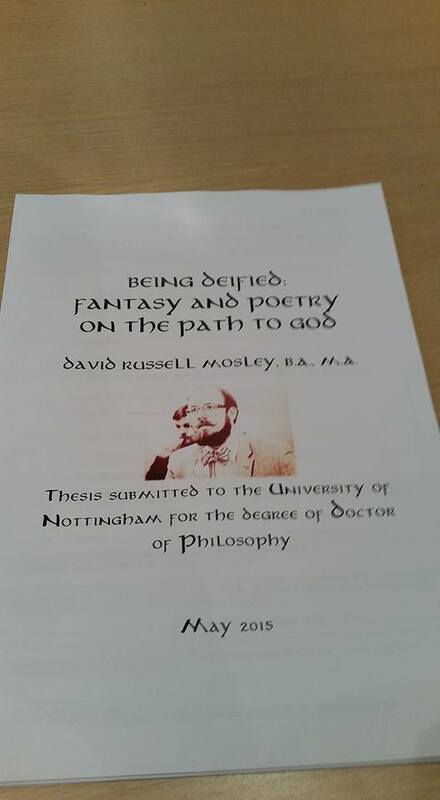 This means I have passed and am, provisionally, Dr David Russell Mosley. I thank my friends and family, especially my parents, my wife and children, my colleagues at the University of Nottingham, the church, the saints and angels who are always with us, and the almighty Trinity. A joke title page for my thesis made by a friend. I sit here in the Humanities Building four hours before my viva waiting. It has been nearly four years since my wife and I got on a plane for England, not knowing what life would bring us. These four years working on my PhD, changing my thesis topic five times and my supervisors once, growing in our marriage, becoming parents of twins, becoming parents of a cancer patient, moving back to America have felt like a whole life’s worth of experiences. It feels almost as though we’ve lived one life all the way through, from the beginning, and now, this viva is it’s conclusion. Toward the end of The Return of the King after the one ring has been destroyed, Frodo’s hand is short one finger; he and Sam sit on the edge of ruin and wait. Frodo says to Sam, “For the Quest is achieved, and now all is over. I am glad you are here with me. Here at the end of all things, Sam.” Frodo believes that he and Sam are about to die as the world of Mordor comes crashing down around them. What they don’t know, of course, is that only in Mordor is it the end of all things. Only the bad things are falling away. Yet in the moment, it seems to Frodo that all is now done. This is how I feel. For four years, really for 10 years now this has been my goal. I have worked, often tirelessly (sometimes rather lazily), toward this end, the attainment of PhD. As that end looms nearer it feels to me like it’s conclusion will be the end of me, will be the end of all things. In a sense, this is true, for it is the end of this part of my life. My formal, institutional education is nearly at an end (unless I go on to get another degree in another field, philosophy or English, for example). The life I have lived up to this point is nearly over. Yet unlike Frodo, I know that this end is also a beginning. I know that this old life is making way for a new one. Soon, hopefully, I will be David Russell Mosley, PhD., husband of Lauren, father of Theodore and Edwyn (and hopefully more), servant of Christ. In a way, Frodo wasn’t wrong either. For him and Sam too it was an end of one life making way for another. Frodo could not return to the Shire, not fully, not now that the quest was over. He had saved it, but not for himself. He had to move on, to bliss. I hope this is not my new life, not yet. I hope instead that my end will be more like Sam’s. He too couldn’t return to his old life in the Shire. Gone were the days of Sam the Servant of Sam the Gardener, at least in the sense of being someone else’s gardener. Now came the days of Sam the husband, Sam the father, and then, Sam the Mayor. I humbly recognise that my chickens are not yet hatched and so I should not worry too much about counting the eggs. Nevertheless, I pray that my return will be like Sam’s one where I cannot return to the life I had, but that the new life will be all the better. I passed my viva today with minor corrections, 3 months. This means I am officially a doctor, but I need to turn in those corrections within 3 months or else I won’t be a doctor. Still, I’m so happy, grateful, and pleased. Praise God!